113416 visits since Jan. 2007. 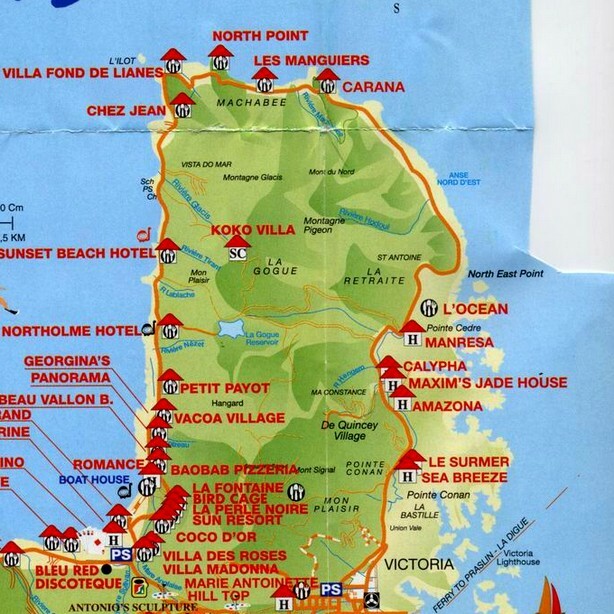 Seychelles are a large country in the Southwestern part of the Indian Ocean. The country is as large in term of sea surfaces that it is tiny in term of lands. 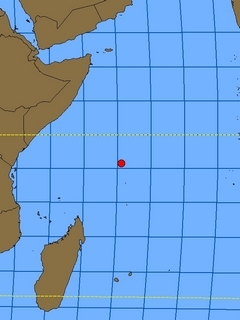 The least small islands are clustered in the northern part. The collect site described here is located on Mahe Island, which is also the capital’s island. North East Bay is located in the northeast part of that island. 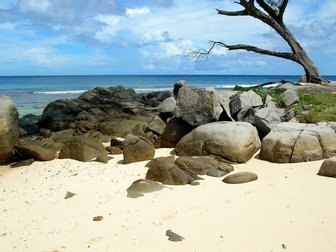 The coastline here consists in a following of secluded beach separated by reefs of nicely sculptured granite boulders (top picture), besides this is about the same for the whole perimeter of the island. I had the chance to visit this site in mid-December 2006 after 2 days of bad and windy weather. 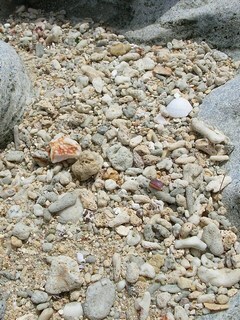 I hoped that these conditions would have thrown a lot of shells on the shore. At this location the beach is quite consistent and extends over a couple of hundreds meters. 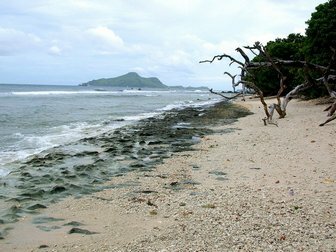 The western part of it consists of sand only as the eastern part has a low eroded and pooled coral reef that emerge at mid tide. This obstacle seemed to retain the incoming dead shells and the walk along the beach between this barrier and the upper sandy part was interesting. A close examination of the coral rubbles patches (left picture) let appear a lot of small dead and broken tropical gastropods shells. 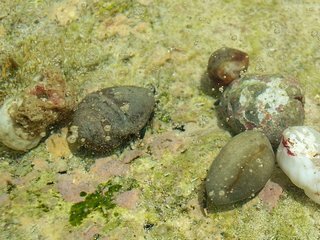 In the waste I managed to retrieve decent species: a few small cowries like the common Cypraea annulus	and Cypraea asellus	. There were also quite a few badly damaged cones like this Conus coronatus	or this Conus rattus	. 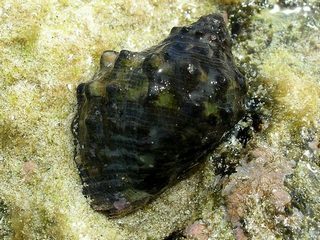 The better shells consisted in this Conus geographus	and fresh dead Nerita albicilla	that could also be found alive (bottom images) lower on the reef together with Nacella (bottom images). 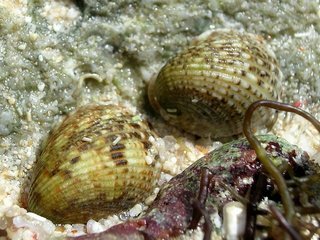 The examination of the small tide pools showed a lot of hermit crabs sheltered in various worn gastropod shells (bottom images). They seemed to prefer Trochidae and Cypraeidae. I must admit that I expulsed a crab from his beautiful Clanculus flosculus	shelter. I am quite confident that he owns a brand new home now. 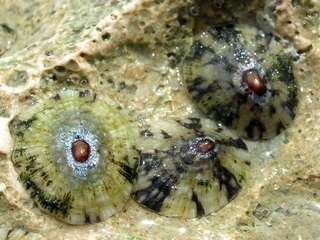 From the coral rubbles, some bivalves could also be retrieved mainly consisting of small Arcidae like this Barbatia amygdalumtostum	. At the end, I got sun burnt but I could find quite a nice sample of tropical indopacific species.